Home Tags Posts tagged with "goulash"
Red Alert! Random Eastern European dishes are invading our streets and restaurants! Should you duck and cover, or welcome the enemy? Seäsonal Restaurant & Weinbar, in Midtown West, is an Austrian restaurant. It is not owned by Kurt Gutenbrunner — an important detail, since New York City counts 10 or fewer Austrian eateries, and the KG-NY Group owns three of the most famous among them. 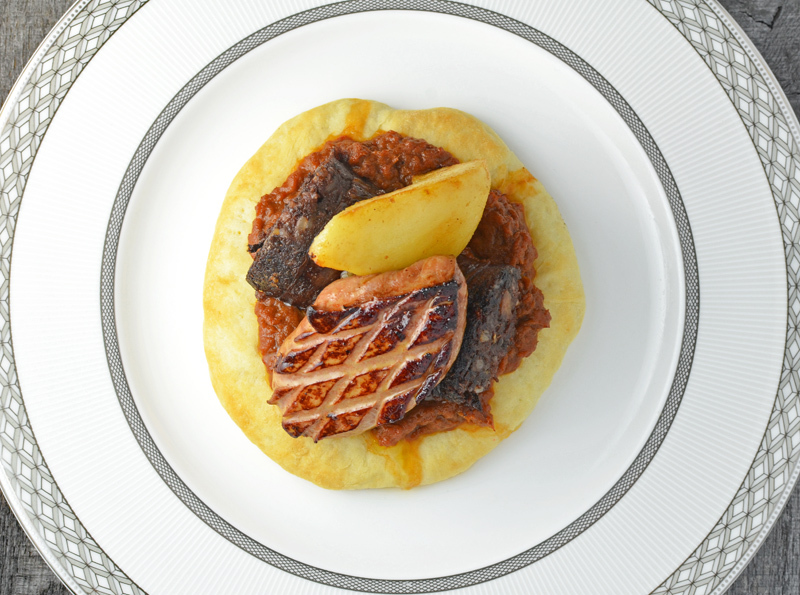 Wolfgang Ban and Eduard Frauneder have perfected their own modern take on Austrian cuisine – one which combines traditional techniques, contemporary innovations, and updates to some of their favorite childhood dishes. 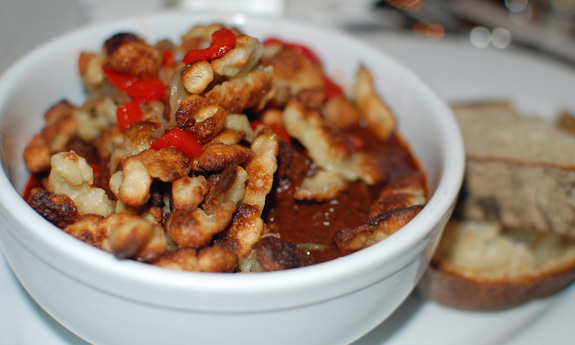 What makes the place Red-Alert-worthy is the goulash, of course. A dish hailing from neighboring Hungary but transformed into something quite different (and closer to a pörkölt) in Austria. 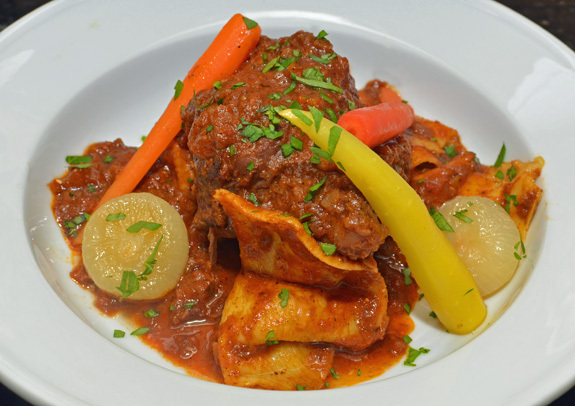 When people think of Hungarian cuisine, the first dish that comes to mind is probably goulash (gulyás in Magyar). The real deal, however, is most likely different from what you think. In Cuisine of Hungary, George Lang warns us that a true gulyás should contain no spice other than paprika and caraway, and gives us the origin of the recipe. Shepherds used to cook cubed meat (beef or mutton) with onions in a kettle until all the liquid evaporated, and then they dried the result in the sun so they could reheat it in water whenever they needed it. People nowadays usually don’t carry around their dry goulash for impromptu snacks anymore, but the basic method remains: the meat is simmered until done, and then water is added, either in small amount to make a stew, or more liberally to obtain a soup. In Central Europe, and Western Europe even more so, gulyás has evolved into goulash, vaguely defined as “a stew made with meat […], assorted vegetables, and paprika”. Today’s rendition is definitely of the bastardized kind, though no less tasty for it. You may remember my Venison Goulash, and this recipe is pretty close to it, but less wintry — red peppers replace the root vegetables. While you can certainly use it with great success to prepare a beef, pork, or chicken goulash, I’ve chosen to focus on making… sauce. With this recipe, I’m killing two old Eastern European birds with one stone. The combination isn’t just a gimmick, though; the two dishes actually work really well together! 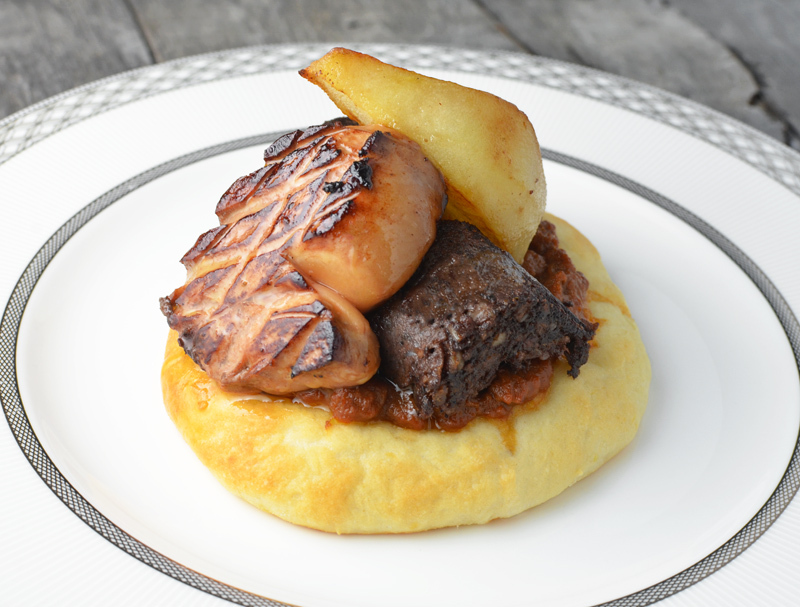 The venison goulash uses one of the forelegs of the deer I killed last season. This is not a Hungarian gulyás, but rather the kind of winter goulash you would eat in Czech Republic or Austria — my recipe was inspired by something I found in Kurt Gutenbrunner’s Neue Cuisine. I recommend cooking it a day in advance, so that the flavors can blend overnight. The unusual way the leg is marinated (by being plunged in boiling stock first) comes from Alain Senderens’ Canard Apicius 2010. Senderens claims that his method gets better results than sous-vide cooking. I had previously tried it on a roasted leg of deer and was really impressed, not to mention that I wouldn’t know how to cook a whole leg sous-vide in my home kitchen! Even if the long, gentle cooking of the goulash is likely to tenderize any tough joint of meat, I figured it wouldn’t hurt to use the Senderens method, especially since I planned to marinate the leg anyway. 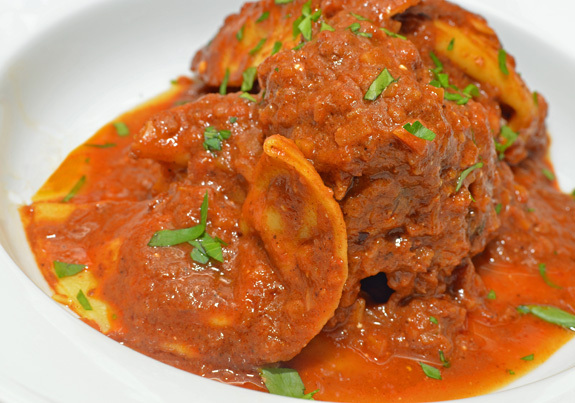 If you don’t have a whole deer leg, you can buy venison osso buco (here, for example), shorten the marinating time to one day, and scale the recipe accordingly. 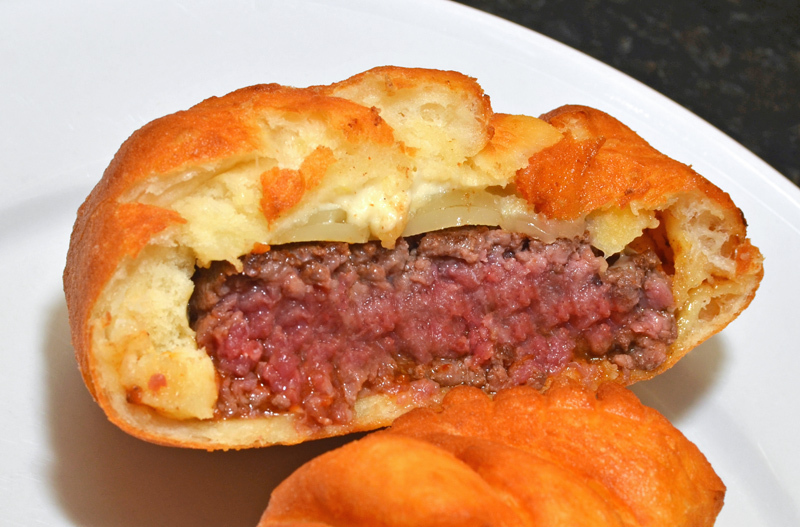 Potato varenyky are Ukrainian dumplings similar to Polish pierogi but not fried. I found out they have a bit of a cult following, and several monuments have been erected to their glory. 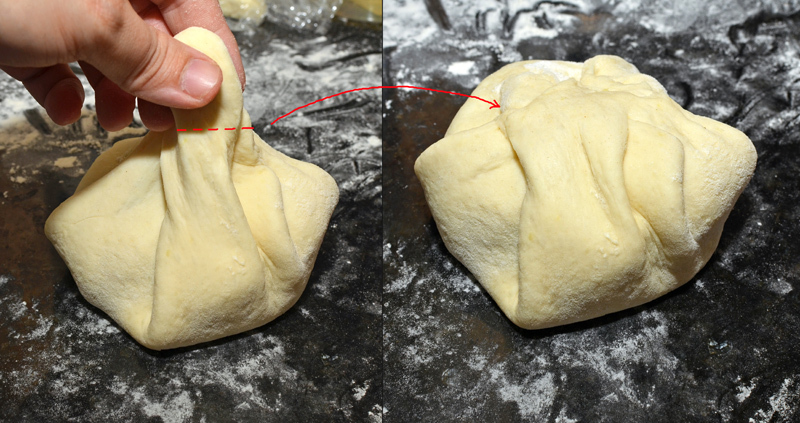 For this recipe, I am using the same rich filling as for my knishes. If you think of pierogi as a poorman’s dish made of potatoes, flour, and water, try these and have your mind changed. 🙂 Of course, you could choose to make them without the goulash, and serve them with sour cream and fried onion as tradition dictates. If you do prepare together, the proportions below yield about four varenyky per plate, but you could decide to serve slightly fewer (or more). Take a taxi to Korzo Haus. Sorry my recipe takes so long, but when you’ve spent 12 hours freezing in a tree stand to kill your deer, you’re not gonna rush the cooking! In a pressure cooker over high heat, sauté the oxtail in olive oil until brown on all sides. Add the carrot, onion, red pepper and garlic, and stir for 2-3 minutes. Add the red wine, cloves, peppercorns, juniper berry, cardamom, thyme and bay leaf, and simmer for another 2-3 minutes. Add the water, cover, bring to pressure, then cook under pressure for 1 hour. Let cool for 30 minutes and pass through a chinois. Chop the deer leg in half at the joint. In a pot large enough to contained the two pieces covered with beef stock, bring the stock to a boil. Add the deer leg and let sit for 3 minutes. Remove the leg from the stock, then let the stock cool. Return the leg to the pot, cover and refrigerate for at least 2 days. Slice the onion and garlic very thinly using a mandoline. Chop the celery root and carrot into a brunoise (the mandoline can also help you do half of this work). In a saucepan over medium heat, heat the paprika, piment d’espelette, anise, coriander, cumin, caraway and allspice for 3 minutes, shaking regularly. Reserve. Chop the deer leg into a total of 6 pieces. Season with salt and pepper. 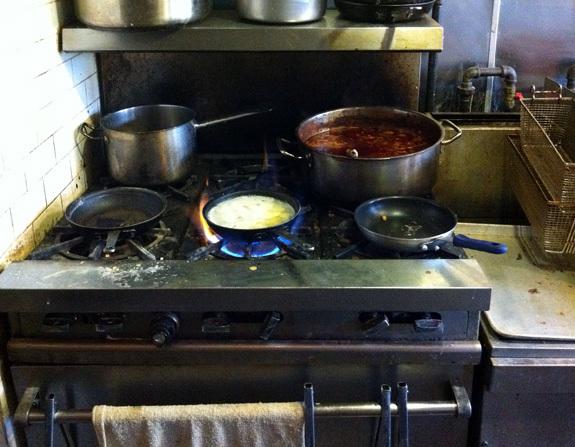 Heat the olive oil in an oven-proof pot over high heat, then sauté the venison until brown on all sides and reserve. In the same pot over medium heat, sauté the onion and garlic until soft, then add the spices and stir for 2 minutes. Add the celery root, carrot and tomato paste, and cook for 5 more minutes. Return the meat to the pot, add the marinade and thyme, and bring to a boil. Cover with a lid slightly ajar, and cook in a 200 F oven for 6 to 8 hours, until very tender. Let rest for 30 minutes. Remove the meat from the pot, and reduce the sauce over high heat by about 1/3. Use a hand blender directly in the pot to blend some, but not all of the chunks — you want the sauce to have a thick, coarse texture. 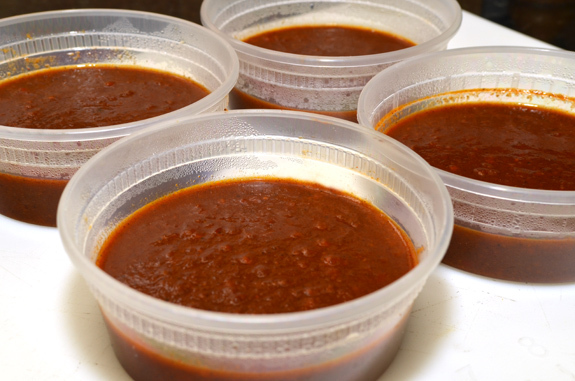 If you don’t have a hand blender, just transfer 1/3 to 1/2 of the sauce and chunks to a regular blender, process until smooth, and return to the pot. Mix in the sour cream, return the meat to the pot, and reserve. Cut 24 discs (6 discs in each batch) using a 3 1/2″ cutter. Brush each disc with the egg wash, place a spoonful of potato purée in the center, then fold into a half-moon shape and seal the edges with your fingers. Each one should have a generous amount of potato, but not so much that it’s difficult to seal properly. Keep the varenyky on a sheet tray dusted with semolina. Cook the varenyky in a large pot of boiling salted water until al dente. Drain, toss into a bowl with the butter, cover with plastic wrap and reserve. If you plan to serve them on their own, however, cook until soft and serve immediately. Place the butter and water in a small saucepan over low heat. Add the onions, cover with a lid, and cook for 45 minutes, flipping the onions a couple times along the way. Remove the lid and cook for another 10-15 minutes. If the liquid is completely reduced, add a little bit of water. Remove from the heat and reserve. 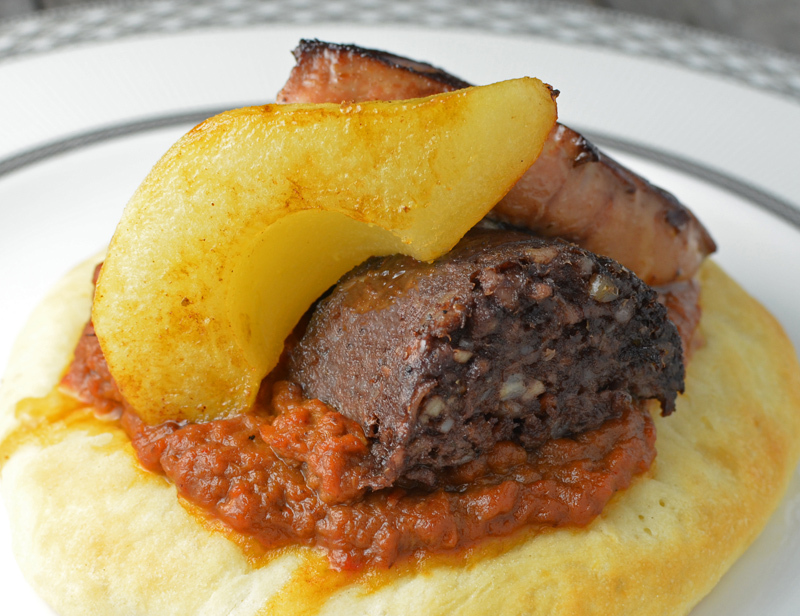 Add the potato varenyky to the venison goulash, cover, and reheat on low heat. Blanch the carrots in a little bit of salted boiling water until almost cooked, then transfer to a small saucepan with the caramelized onions, and reheat on low heat. 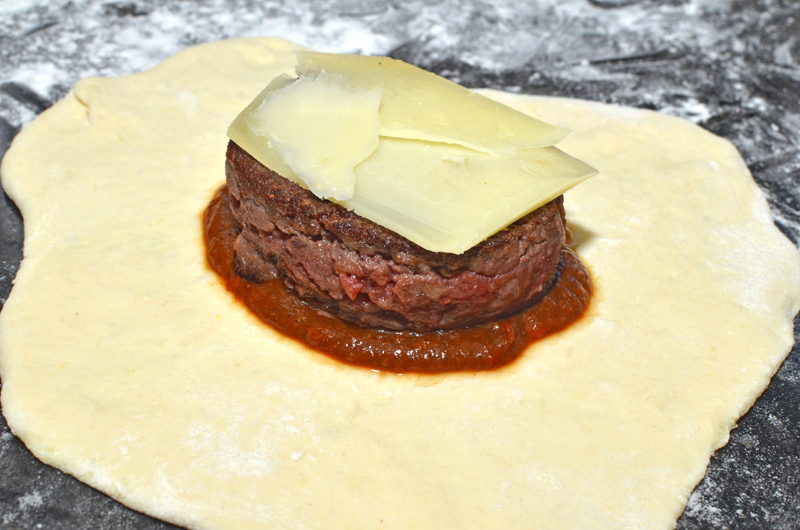 Serve with a generous amount of sauce, and sprinkle with parsley. 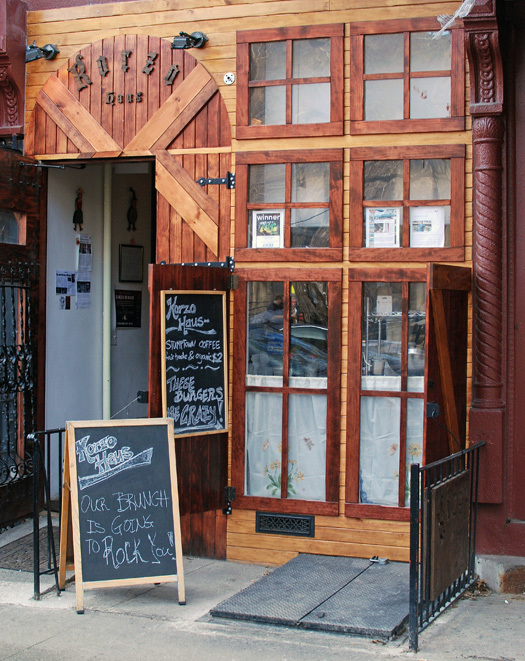 From the outside, Korzo Haus just looks like another hole-in-the-wall located in a forgotten block of the East Village — in so far as there is such a thing. Even the blackboards simply advertise your usual brunch, coffee and burgers. 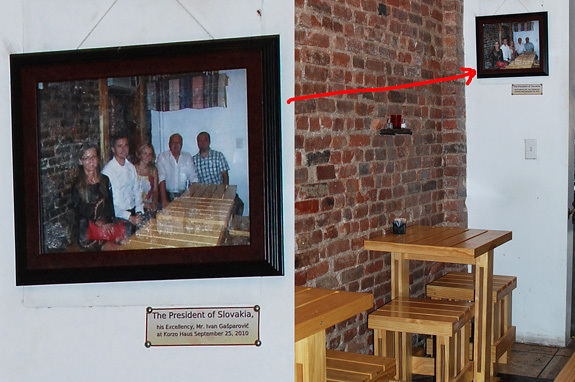 However, if you pass the short-order kitchen in front and inspect the diminutive dining room (which consists of a few tiny two-tops and a communal table that isn’t much bigger), you may notice the picture on the wall and wonder why the President of Slovakia chose to visit this place. You may also wonder which person on the picture is really the president (hint), but that’s beyond the point. The explanation comes when you read the menu: the dishes seem to come straight from a café at the trijunction between Austria, Slovakia, and Hungary. Austrian bratwurst and potato salad shares the scene with Slovak halušky with bryndza, and Hungarian langos and goulash. 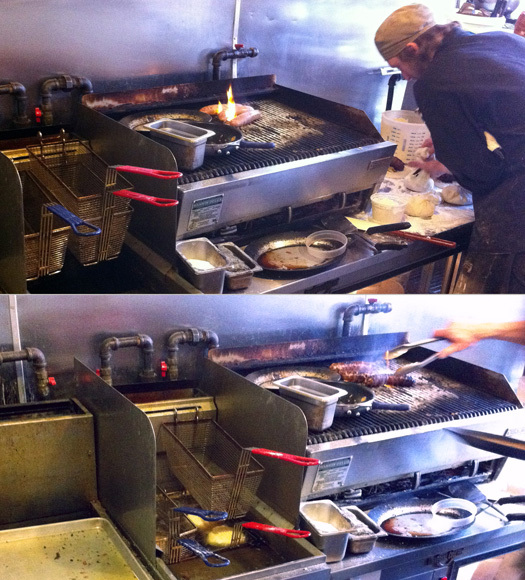 Many of these specialties are then rearranged into egg or burger offerings. There is no wine to rinse down the food, but there are about a dozen kinds of beer, mostly from Central Europe and the US. Okay, à la minute is a bit misleading, as it will take quite a few minutes before the dish finally hits your plate. But the result is worth the wait! 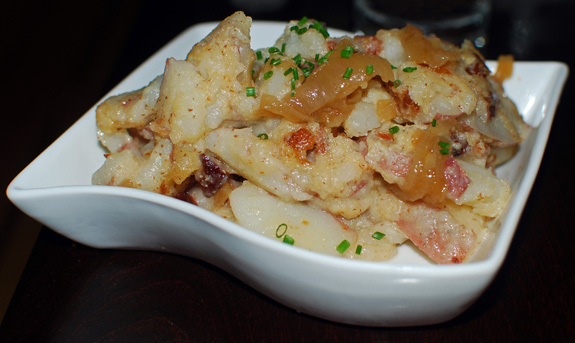 I don’t hesitate to say this is the best potato salad I’ve ever had, mixing delicious potatoes with sautéed onions, bacon dice, and just the right amount of mustard. 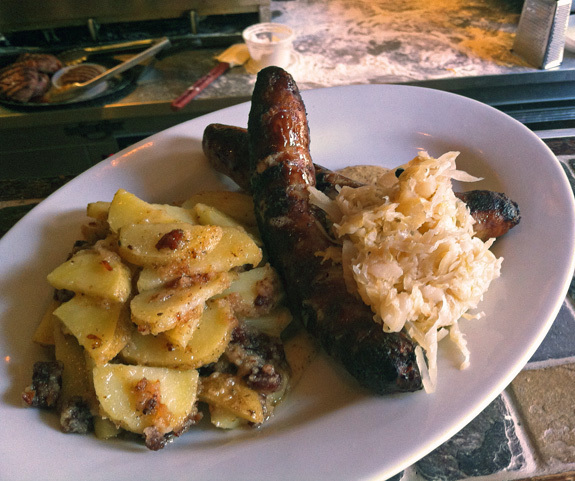 The bratwurst is served either on a roll, or with the same potato salad and some sauerkraut. The sausage was tasty and appropriately greasy, though not excessively so. 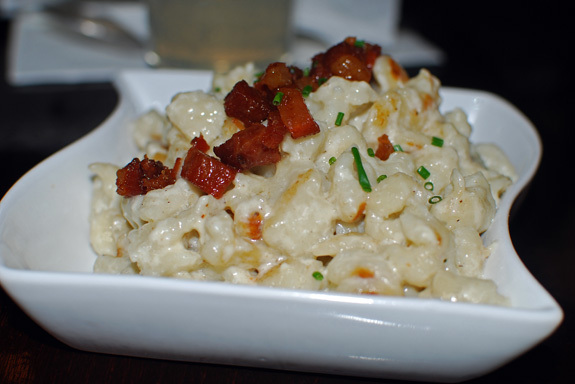 Moving on to Slovakia, we ordered the halušky (the Slovak version of spaetzle), which come with either bacon and chives or bryndza (a cheese similar feta). Simple but good. More halušky, deep-fried this time, arrived with the goulash, adding an interesting crunch to the spicy Hungarian stew that you see bubbling on the back burner in the kitchen. I found the beef brisket very tender, but too much caraway in the sauce overpowered the dish. “The Original” came with bacon, emmentaler cheese, mustard and pickle. 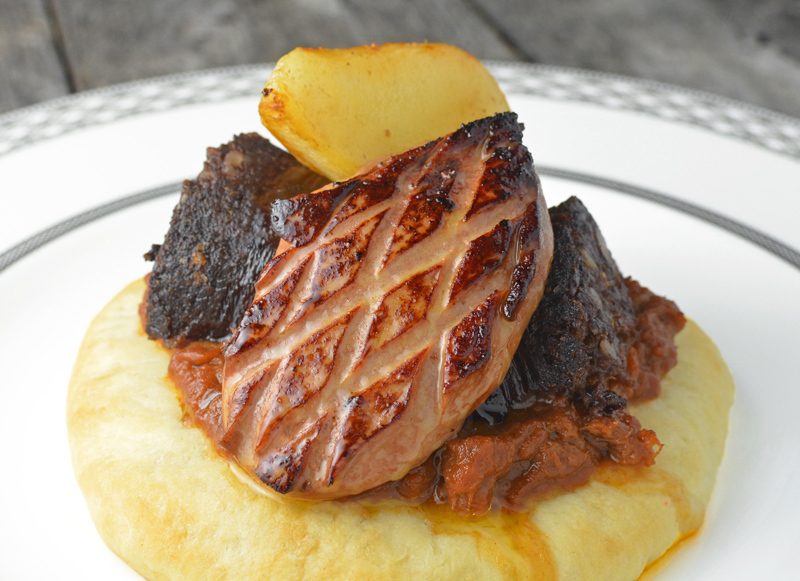 “The Slav” was topped with slow-cooked pork neck, saeurkraut and bryndza. Both were good and pleasantly decadent, and you hardly needed an appetizer before them. My main reproach would be that the meat was too packed (later on, I actually noticed that the chef was pressing those patties a lot). Ground meat in burgers is best if it’s pressed just enough to not fall apart. 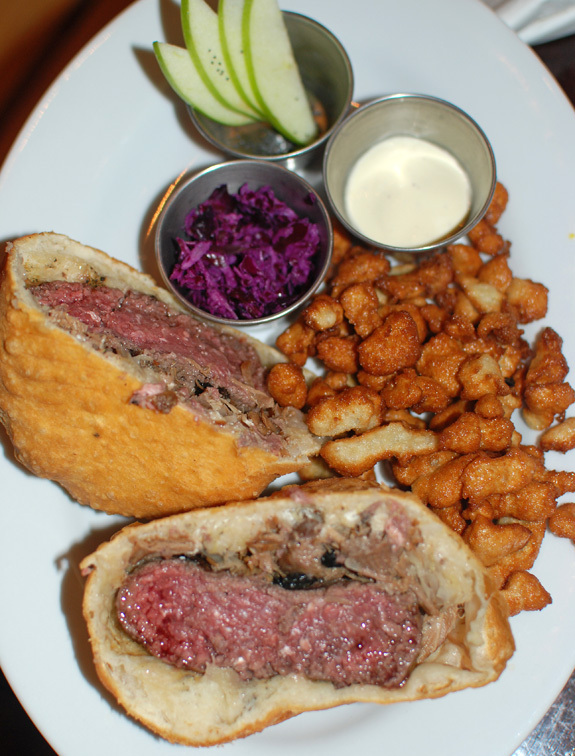 And while the deep-fried halušky went well with goulash, they were less satisfying with burgers. Not to mention I was reaching halušky saturation. 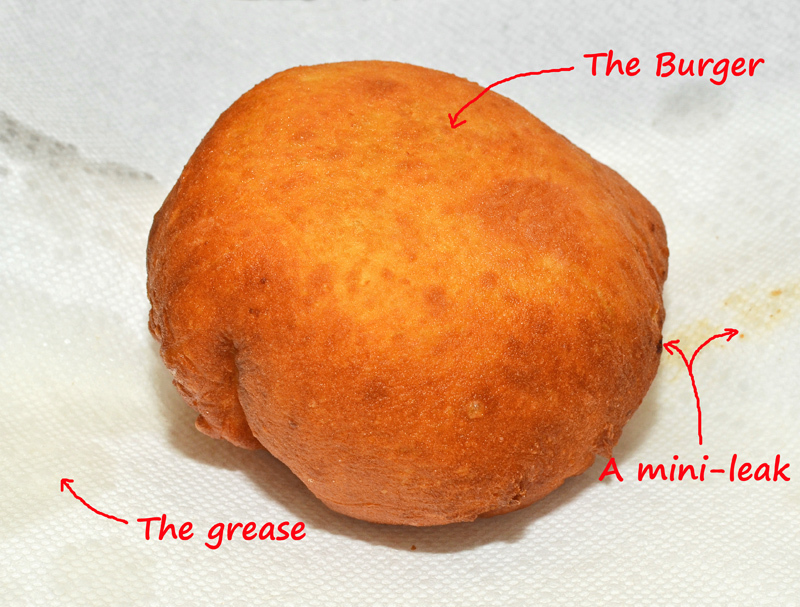 Surely, there must be a Slovak fried potato specialty that could be tapped into instead. There were no desserts, and I don’t know where the kitchen would find the space to prepare them. Too bad — a slice of strudel would have fit perfectly.